Did you know that Burger King sells hot dogs in America but not in Canada? Is it because Burger King is already making big profits here and doesn’t need to attract business with hot dogs? Are Canadians so much more health conscious that Burger King’s brass thinks we won’t buy enough of BK’s 100 percent beef, flame grilled classic dogs? Or, is it because they think something so quintessentially American, as iconic as the Statue of Liberty, wouldn’t sell above the 49th parallel? Well, they’d be wrong on that score because hot dogs are just as popular in Canada. Beginning in earnest, on July 4th, summer becomes the season of backyard cookouts in the United States. More hot dogs are consumed on July 4th than perhaps any other day on the calendar. But, consider Canada Day. Surely, per capita, we must consume an equivalent number. 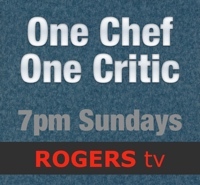 What would the Regatta or all the other Canadian sporting and summer events be without hot dogs? Our supermarkets sell dozens of varieties of hot dogs and buns to go with them. Service stations with shops and convenience stores, like Marie’s, all seem to have electric hot dog roller grills. Yes. We Canadians love our hot dogs as much as our neighbours to the south. Perhaps you haven’t heard, hot dogs aren’t as bad for you as they used to be. All food is safer than it was prior to the professional food inspection and regulation we have now. Let’s face it, regulators haven’t turned a blind eye to hot dogs. We pay more attention to what we eat and food producers have responded to shifting tastes. 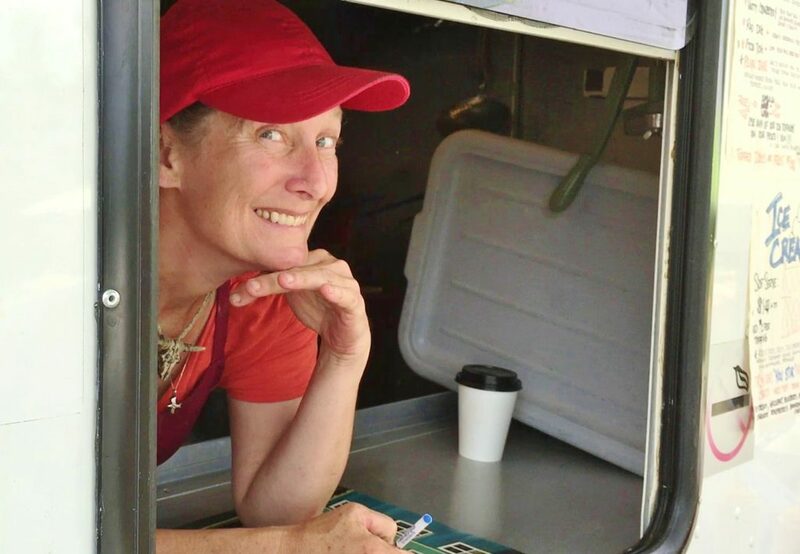 Canadians not only love hot dogs, some of us are passionate enough to create hot dog businesses. On the gravel road to La Manche Village, just past La Manche Provincial Park, you’ll find a driveway to a private home. It’s on the left, a minute or so in. When you drive up the lane you’ll find something else. Wannie’s Dawgs. 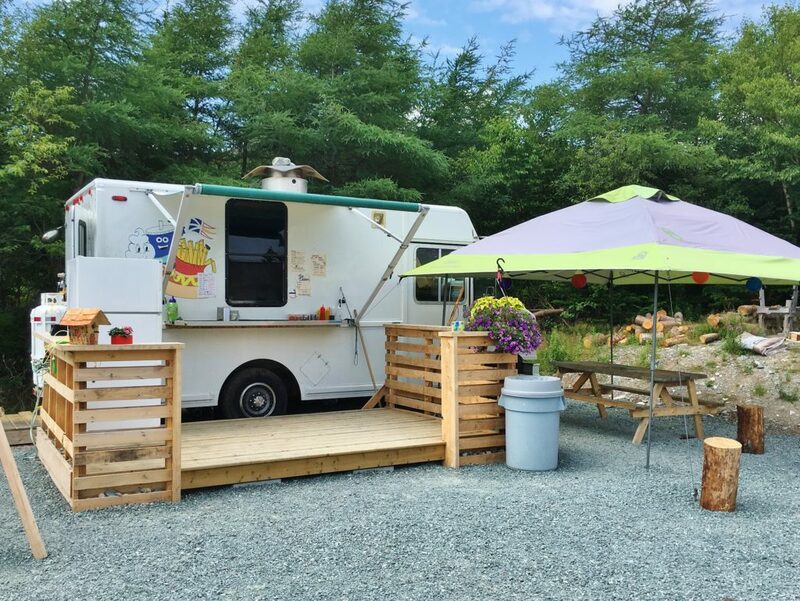 It’s a hot dog truck, with built-on deck and surrounding picnic tables – enough to seat about 20 customers. One’s even under canvas, to shade hot dog diners from Irish Loop sunshine or protect from Southern Shore rain. Wannie’s is named after the owner. Her name is Wanda but her dad called her Wannie. 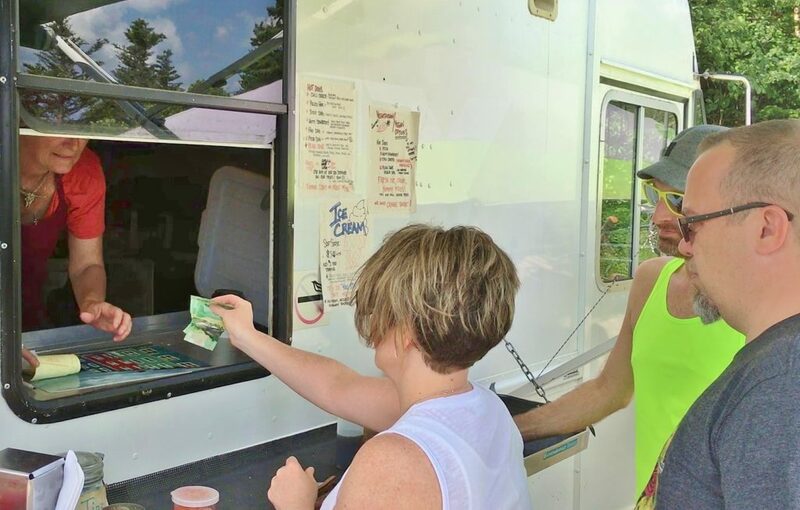 Wannie is betting that this summer enough La Manche Village visitors, East Coast Trail hikers, provincial park guests and locals from Tors Cove, Mobile, Cape Broyle and other communities will keep her fledgling hot dog business going. So far, it seems there are more than enough hot dog lovers in the area to keep Wannie and her helpers busy. 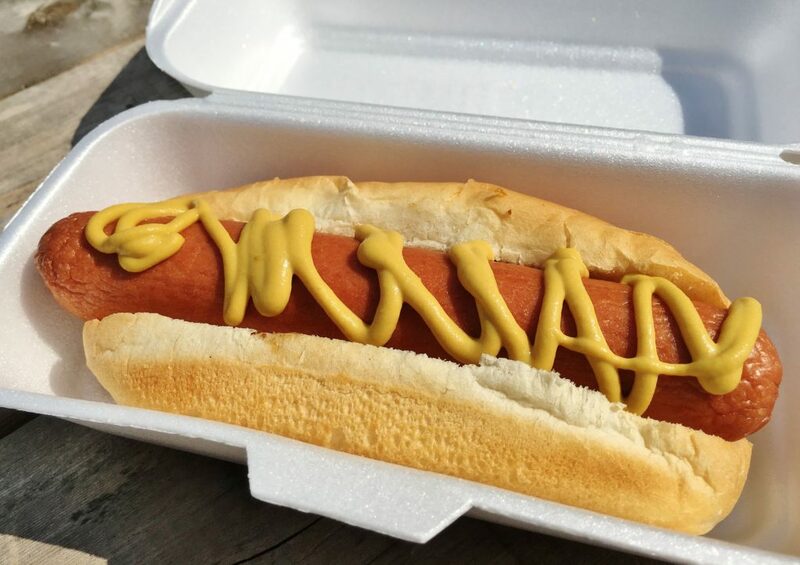 Clearly, Wannie is serious about her hot dogs. 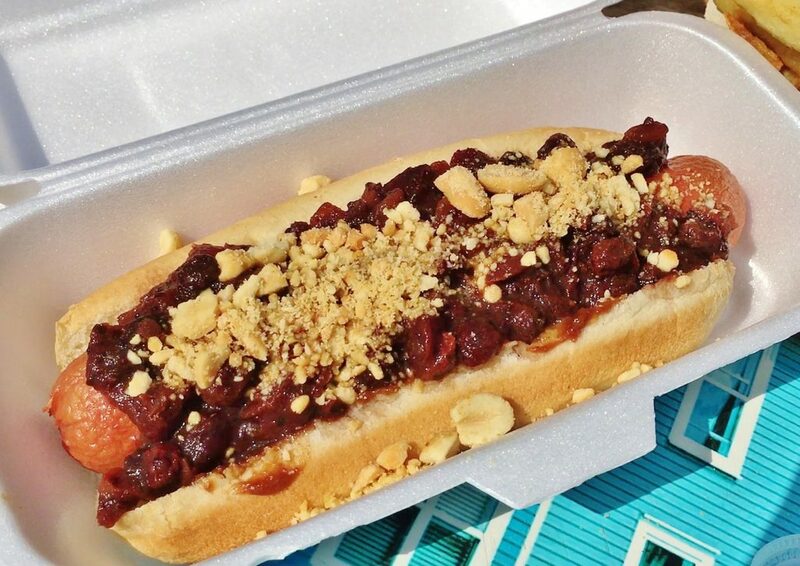 A glance at the menu offers everything from nutty cranberry and chili cheese topped dogs to the classic, Plain Jane dog, with toppings of your choice. Wannie also offers some vegetarian and vegan options, like the Plain Jane veggie dog and fresh cut, crispy fries. 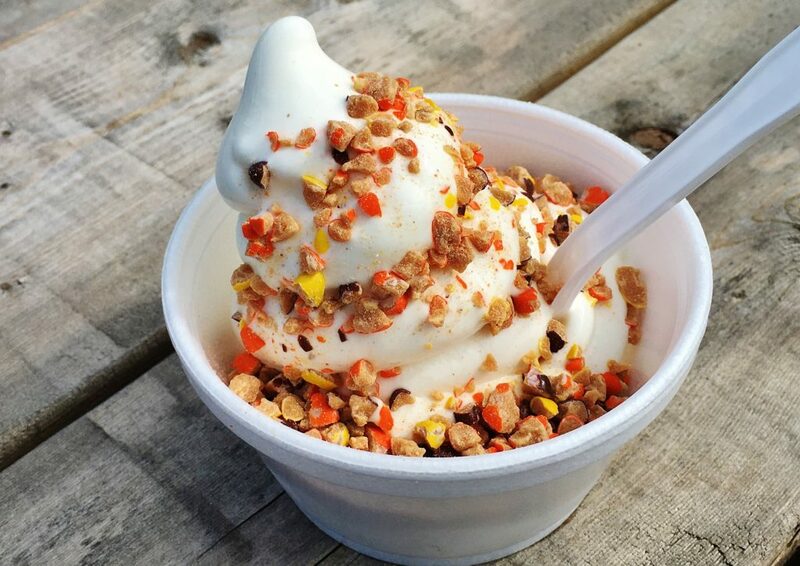 If you still have room, Wannie does soft serve ice cream on a cone, or in a cup, with toppings of course. With so many dogs and toppings to choose from it was hard to know where to begin. The Plain Jane seemed a good place to start. I topped it with mustard. Just mustard. I’m a never ketchup person when it comes to hot dogs. Wannie’s dogs are made from a combination of meats. She told me, “beef and pork.” I tasted pork, lots of pork. It was a nicely plump dog, slightly longer than the bun, which was better than having too much bun. When I bit into the dog it yielded the snap and juiciness that comes from a dog cooked the correct length of time. 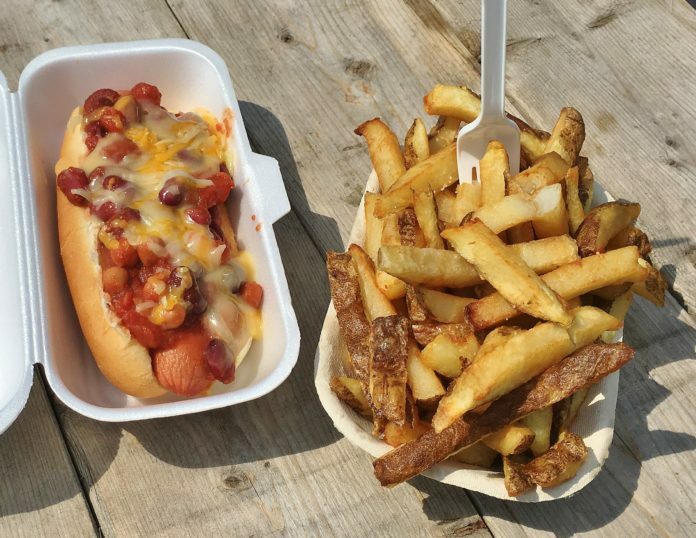 If you’re hunger is unrelenting, the chili cheese dog with fries is your best bet. Wannie’s fries are excellent, just as advertised. Mine were indeed freshly cut, crispy and delicious. The dog was so full it was a challenge to eat. I recommend having at least six napkins on hand. The chili had two kinds of beans and plenty of tomato and chili flavours. Melting cheeses included yellow cheddar and mozzarella. No summertime trip to La Manche would be complete without ice cream. Wannie’s soft serve ice cream in a cup, a big cup, smothered with nutty Reese’s Pieces was the only fit way to complete an outdoor meal of hot dogs on a lazy, sunny Saturday afternoon.